The “European IBJJF Jiu-Jitsu Championship 2019” was held in Lisbon, Portugal, from 15 to 20 January. Athletes from all over the world successfully performed at the competition and took home honored medals. Sportsmen from the “Atos Ukraine” team were among them! 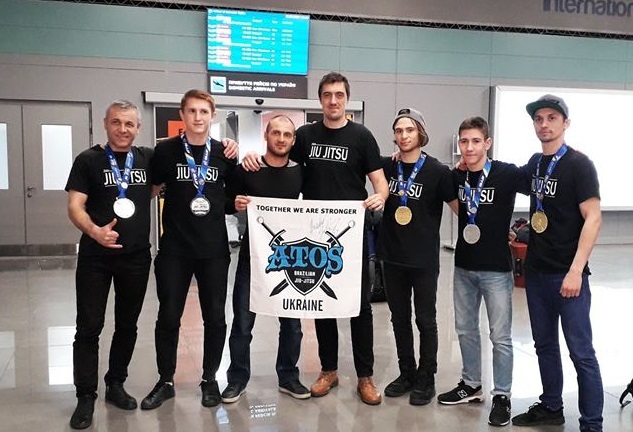 6 fighters from the “Atos Ukraine” team have visited the championship this year. Talented Ukrainian sportsmen won 2 gold and 3 silver medals. According to the club coach, this competition was more successful compared with last year’s championship. Fighters have analyzed all mistakes and had serious training before the championship to improve own skills. According to the results of the championship, Valerii Deineha won gold in the “Master 1” category and Heorhii Baidan won his gold medal in the “Adult” category. Serhii Leshynov got silver in the “Master 3” category. Vladyslav Perepelytsia and Yevhen Benevskyi won silver medals among juniors. All athletes competed in the category of white belts.